Details were sparse, but the company's said before it wants to expand its hidden services. Even online anonymity and privacy need a crowd of sorts--crowdfunders, to be specific. 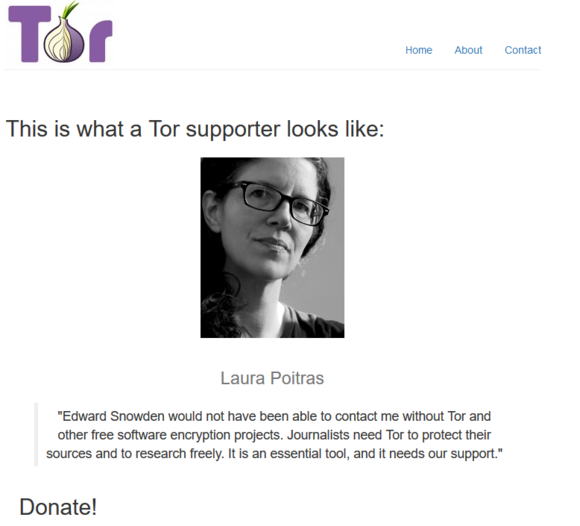 The Tor Project recently kicked off a crowdfunding drive, using journalist and filmmaker Laura Poitras as an example of the importance of the online anonymity tools. In a blog post announcing the funding drive, Tor quotes Poitras saying that she never could have worked on and help break the Snowden story without Tor. Poitras worked with Glenn Greenwald on the initial revelations from documents leaked by former NSA contractor Edward Snowden. She also directed the Snowden documentary Citizenfour. “Tor is an essential tool that...fosters free speech and independent voices,” she said. Tor’s blog post on Tuesday didn’t have much in the way of specifics about the new crowdfunding drive or what motivated it. The Tor Project did not respond to a request for comment in time for this story. Hidden services allow users to connect to online products and services such as websites, blogs, forums, and chat clients. The big difference, however, is that the user and the site they are connecting to don’t have to give up identifying information, allowing for a higher degree of anonymity. The Tor Project’s new donation page. Why this matters: Tor and hidden services have gained a fair bit of attention in recent years. Stories about the technology run the gamut from illicit black markets such as Silk Road to connecting anonymously to Facebook. Those examples may seem trivial, but Tor can be an important tool for investigative journalists, human rights activists in oppressive countries, and average users around the world hoping to get around government online censorship. As of March, about four percent of Tor traffic came from hidden services, with the rest coming from users connecting to conventional websites. In 2015, Tor’s funding came from a variety of sources including the National Science Foundation, the U.S. State Department, Reddit, and more than 4,000 individuals. The group hopes to increase that number of individual donors. “Crowdfunding allows us to engage the broader community in grasping the opportunity that this new technology promises,” the Tor Project said in March. The Tor Project didn’t specify what it wants to do with any new funding. In general, the group uses donation funds for maintaining network scalability, improving user and relay support documentation, improving software usability, coming up with user incentives to maintain relays, and research. As for hidden services, the Tor Project said in March it wanted to improve hidden service technology, create a user dashboard application for hidden service operators, and build a way to create hidden services that reduce server anonymity but still protect users with Tor encryption and anonymity.